So you bought that new bike and you want to fine tune the suspension to fit your riding style. Twelve way rebound, ten way compression adjustments, and preload what? OK so it can be a bit confusing and the truth is, it's not the easiest thing to master. However if you want to get the most out of your bike it's something you need to know. Hopefully the basic knowledge below will help you gain some confidence in tackling suspension. The components, where are they and what do they do. Usually located on top of the fork in the center of the preload adjuster. Controls the extension of the fork after it compresses. Screw in for firmer/ quicker extension and out for softer/ slower extension. Use a screw driver to adjust. Turn in all the way and then turn out and listen for the clicks. If you have a ten way adjustment it will have ten clicks. First click out, firmest setting, tenth click out, softest. If you don't have any adjustment you can alter the firmness by the weight of the shock oil. You can also adjust the firmness by changing the springs inside the fork. You should adjust the front fork preload, rebound, and compression settings equally/ by the same percent or close to it, if your not sure exactly what your doing. Always make sure the right and left fork are adjusted exactly equal. Located on top of the fork and can be adjusted using a socket or wrench. Preload is the amount you compress the front fork spring from its normal state. The more preload/ the more you compress the spring. The stiffer the fork becomes. The preload adjustment settings can be seen by the circular rings or marks. If you have a five way adjustment it will have five marks. One mark showing is the stiffest setting. Five marks showing is the softest setting. Preload adjustments generally make the most noticeable change to the front fork stiffness or the amount the bike dips forward under heavy braking. If you have this adjustment it is usually located at the bottom of fork. It controls the compression of the fork when it hits a bump. Screw in for firmer/ slower compression and out for softer/ faster compression. Use a screw driver to adjust. Turn in all the way and then turn out and listen for the clicks. If you have a ten way djustment it will have ten clicks. First click out, firmest setting, tenth click out, softest. Not all bikes have this adjustment, and some have it linked to the rebound damping. You should adjust the front fork preload, rebound, and compression settings equally/ by the same percent or close to it, if your not sure exactly what your doing. Always make sure the right and left fork are adjusted exactly equal. Instead of at the bottom of the shock like the front forks, the rear compression damping adjustment will be at the top of the rear shock. It will be on a remote reservoir connected to the top of the shock like the photo to the left. 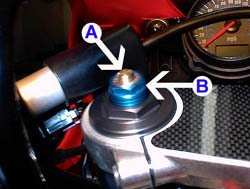 It may also be connected by a hose and the reservoir located under the seat or slightly above and to the side of the rear shock. It controls the compression of the rear when it hits a bump. Screw in for firmer/ slower compression and out for softer/ faster compression. Use a screw driver to adjust. Turn in all the way and then turn out and listen for the clicks. If you have a ten way adjustment it will have ten clicks. First click out, firmest setting, tenth click out, softest. You should adjust the rear preload, rebound, and compression settings equally/ by the same percent or close to it, if your not sure exactly what your doing. Adjusting the rear preload will usually make the biggest difference in the handling of your bike. Unfortunately it is also the most difficult adjustment to make to the rear suspension. The rear preload is the amount the rear spring is pre -compressed. The tighter the spring is compressed, the stiffer the rear suspension becomes, and the higher the rear end of the bike will sit. This rear height change will put more of the bikes weight on the front, affecting the handling. To adjust the rear preload you will need a C-spanner which is a large C shaped wrench. You can use a hammer and punch or dowel, but this may damage the adjustment ring nuts. First loosen the top ring nut separating it from the bottom ring nut. Now you can tighten and loosen or move the bottom ring nut up and down. Up will decrease/ soften the preload and down will increase/ stiffen the preload. Once you have the bottom ring nut where you want it, tighten the top ring nut to the bottom. Be careful not to over tighten the ring nuts together and strip them. Small adjustments to the rear preload will make a big difference. 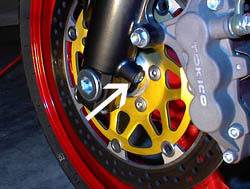 If you do not have two ring nuts for adjustments you may have a metal ring located above the spring on the shock, that has step adjustments on the ring. To adjust this you may first have to loosen a locking screw on the ring if there is one. Then move the ring to the left or right to adjust the preload. Remember to tighten the locking screw. 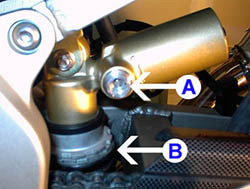 Usually located on the bottom of the rear shock unlike the front fork adjustment. Controls the extension of the fork after it compresses. Screw in for firmer/ quicker extension and out for softer/ slower extension. Use a screw driver to adjust. Turn in all the way and then turn out and listen for the clicks. If you have a ten way adjustment it will have ten clicks. First click out, firmest setting, tenth click out, softest. Some bikes have a knob that you turn left or right to make the adjustment, but it still makes clicks. You should adjust the rear preload, rebound, and compression settings equally/ by the same percent or close to it, if your not sure exactly what your doing. Some bikes will have a rear ride height adjustment. 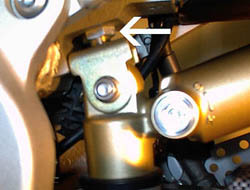 It may be a screw coming out of the top of the rear shock, like in the photo to the left, or it may be a screw coming out of the bottom of the rear shock. Both adjust in a similar way. If you adjust the ride height of the bike you will also change the weight distribution of the bike. Raising the rear will put more weight on the front. 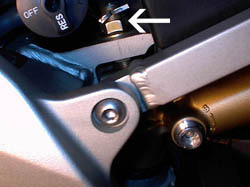 This will cause the bike to turn in quicker or easier, but can make the rear unstable or cause tank slappers. If you notice these negative side effects increasing the front preload may be the solution. A raised rear, weight forward adjustment is usually best for track situations, but not everyday riding, so they say. To adjust the rear ride height loosen the nut on the bolt farthest away from the shock. Then adjust the closer nut raising or lowering the rear. Finally tighten the farther nut. You can also adjust the ride height by lowering the front triple clamps on the front forks. However that is fairly more difficult, and should only be done by someone who knows what they are doing. Since a very small adjustment up front can make a huge difference. 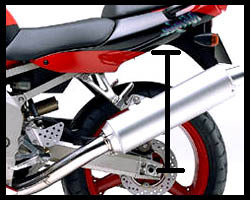 This is a way of adjusting your suspension by measuring the amount it compresses with the full weight of the rider on it. Your front and rear suspension should sag an equal amount. The general rule is that your sag should take up the first third of your suspension travel. Front and rear preload are the two main adjustment in this technique to get the correct sag. Then dial in the other adjustments for fine tuning. Some people swear by this technique even though it's a pain. Just follow the instructions below. Put on the gear you normally ride in to get the weight correct. Find two friends to help you measure and hold the bike. Without you on the bike, extend the front fork completely. 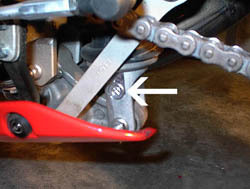 Measure to the seal wiper to the triple clamp, or to the axel clamp for an inverted fork. This measurement is "S1"
Sit on the bike in your normal riding position with your feet on the pegs. Have your friend hold the bike from the rear vertical/ centered. Now have your other friend push down on the front forks, let go and let the forks extend slowly. Take the same measurement you took above again. This measurement is "S2"
Finally have your friend at the front of the bike pull up on the forks, let go, and then settle slowly. Once again take the same measurement you took above. This measurement is "S3"
Now calculate the sag using this formula "Sag=S1-(S3+S2)/2"
Confused? If not repeat the above steps for the rear sag, taking your measurements from the rear axle to a point directly above, like in the photo. Symptoms: When you brake hard into a turn or at a stoplight the front end seems to dive down or bottoms out. You accelerate hard and the front of the bike raises up and the back squats down, like a boat. Entering a turn at speed the back or front of the bike feels like it drops significantly and then becomes unstable when get back on the gas. When you hit a bump the you get an extreme double bounce from the front and then the back. Solution: You need more preload. If you notice the symptoms on the front increase the front preload, if the rear, rear preload. Do one at a time and then test it out. One out of adjustment can give the feel of both being out. When you change the preload adjustments you will also be affecting the bikes ride height, which will affect the handling. So if you stiffen the front preload and not the back, the front of your bike will raise. This will cause you to notice that the bike doesn't turn into the turns as easily as before. To correct this and keep the same rear preload adjust the rear ride height or lower the front by raising the fork tubes in the triple clamps. Adjusting the front ride height by the triple clamps can be tricky and needs to be done in very small increment, 4mm at a time or so. Symptoms: It's a sportbike but it feels more like a goldwing. Your suspension is soft and comfy, but feels bouncy. When you get into the twisties the bike has a floating feeling that makes road feedback vague at high speeds. The bike seems to bend in the middle. Solution: Increase/ stiffen the rebound damping to dissipate the increased bump forces at higher speeds. Adjust the front and the rear independently, testing the changes as you go. Symptoms: When your bike goes over rough road it doesn't seem to absorb the bumps at all. Bumps seem to hit the bike hard and quick, like a pothole. After riding for awhile your sore because your bike isn't properly absorbing the bumps its passing them on to you. Solution: You should first try and reduce rear compression damping. In bad cases your overall setup may be too stiff and you should reduce compression and rebound damping both. Symptoms: When exiting a turn you start to get back on the throttle and the front tends to slid or wash out. On slightly uneven or bumpy roads the front tire feedback goes away and the returns for a second just to go away again. The steering may also feel a bit heavy. Solution: Reduce front fork preload. The front tire is not moving down fast enough and the ride height is probably to high up front. Reducing preload will lower the front and let the forks expand quicker. You Bikes Bars Violently Twitch Back And Forth - A Tankslapper! Symptoms: When accelerating the front wheel shakes back and forth quickly. In extreme cases the bars can almost pull out of your hands or if you hold on tight throw you back and forth on the bike and then cause the back to skip left and right. This is a tankslapper. The bars might also twitch midcorner or feel unstable on turn in. The bike turns into corners to easily. Solution: Increase front fork preload or lower the rear ride height. You have to much weight on the front tire. Symptoms: You get on the brakes hard for that tight left hander and the back tire skids or wiggles side to side. Solution: Increase front fork rebound and preload. You could also lower the rear ride height slightly. Symptoms: Your rear tire feels vague or like it has a slight side to side wiggle, similar to a flat rear tire. You've check your air preasure and it's not low. Solution: Increase rear spring preload. This will stiffen the back for a more solid feel and slow down rear form rising to quickly. SportBikeUSA.com does in no way take responsibility for any errors in this article. SportbikeUSA.com will in no way be held liable for any damage to property or injury to person or persons occurring from following any of the advice above. If you choose to act on any of the information on this page you do so at your own risk and liability. The information contained on this site is not for instructional purposes and is for entertainment only. SportbikeUSA.com will in no way be held liable for any damage to property or injury to person or persons occurring from following any of the information contained within this site. If you choose to act on any of the information on this page you do so at your own risk and liability. The information contained on this site is not for instructional purposes and is for entertainment only. Professional riders in images, Do not attempt advanced riding techniques.